The college town of Athens, just 60 miles NE of Atlanta, beckons visitors with a vibrant, restored Victorian-era downtown teeming with art galleries, trendy shops, renowned night clubs and distinctive dining. Historic architecture and impressive gardens complete the unique blend of traditional heritage and trend-setting southern culture. The vibe and energy that gave birth to R.E.M and the B-52’s is alive and well today! 1:00 PM – Welcome to Athens! : We’re excited to share with you the very Best of Athens! 1:00 PM – Terrapin Beer Co.: Enjoy tasting flagship brews and seasonal specialties, relax in the tasting room or on the expansive lawn with a “picnic lunch” and learn how award-winning craft beer is made with a brewery tour. 2:45 PM – Hotel check-in, refresh – Homewood Suites by Hilton: Homewood Suites celebrated its Grand Opening in early 2019, making it Athens’ newest hotel. The spacious patio gathering area overlooks the Firefly Trail, a multi-purpose path along the Middle Oconee River that will eventually 39 miles south to Union Point. Breakfast AND afternoon reception included gratis. 3:45 PM – Georgia Museum of Art: The state of Georgia’s official art museum houses a permanent collection of more than 10,000 works of art as well as 20 to 25 temporary exhibitions a year. The Jane and Harry Willson Sculpture Garden hosts rotating exhibitions of work by women sculptors. Strengths include American painting, works on paper, southern decorative arts and self-taught art, as well as works by African American artists and a Samuel H. Kress Study Collection of Renaissance and Baroque art. 4:45 PM – Creature Comforts Brewing Co.: This downtown Athens brewery continues to grow its stellar reputation, from “Best of” beer industry lists to the beer of choice for Thor in the new Avengers movie! 5:30 PM – Athens Heritage Tour: Athens, named after the Greek center of learning, is the birthplace of higher education in America. Your tour guide will share historic neighborhoods and stories on this driving tour, which is offered daily for visitors. 7:00 PM – Dinner – The National: Local chef Peter Dale came up through Hugh Acheson’s kitchen at Five & Ten and now owns several Athens restaurants. The flagship, The National, explores Mediterranean flavors through local ingredients. 7:30 AM – Breakfast at hotel – Homewood Suites by Hilton: Homewood Suites offers guests a full hot breakfast. Early risers will enjoy a stroll along the Firefly Trail, located just behind the hotel. 9:00 AM – Athens Music History Tour: Athen’s has been a force in the music world for over 40 years, starting with the B-52s, R.E.M., and Widespread Panic. Today, hundreds of bands still call Athens home, playing any and all genres of music. Get a behind-the-scenes look at Athens music heritage on this lively driving and walking tour. 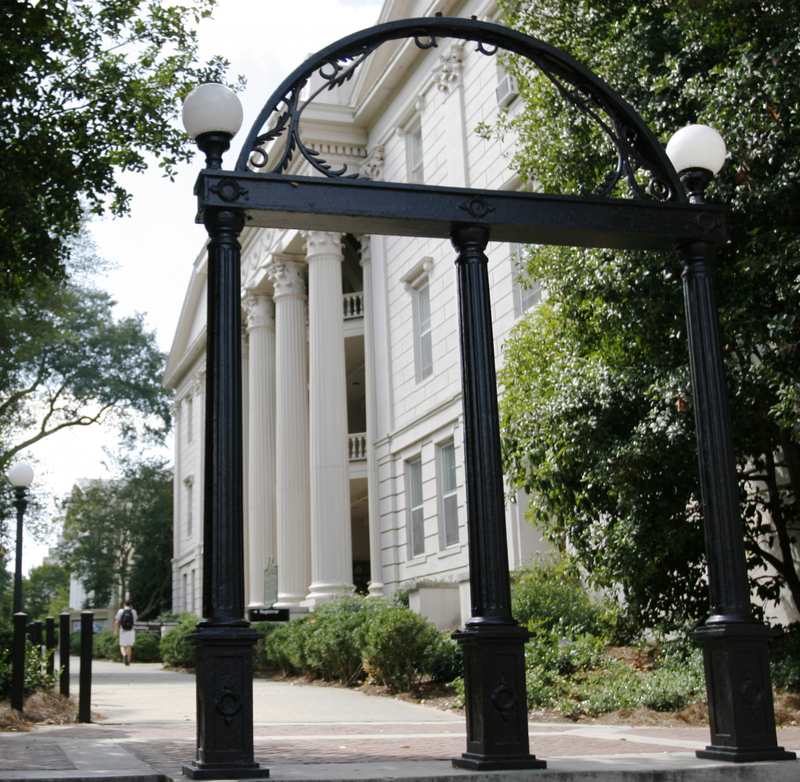 11:00 AM – Walk through UGA’s Historic North Campus: Stepping through the landmark Arch is stepping back in time two centuries to the birthplace of public higher education in America. This walking tour of North Campus (which is modeled after Yale’s) includes fine Antebellum architecture and gardens. 12:00 PM – Lunch: Dine at one of the sites featured in the music heritage tour. 1:30 PM – Shop & Stroll in Downtown Athens (on your own): Take time to stop in record stores, vintage shops with plenty of hipster and mid-century finds, and boutiques with locally-made items. 5:15 PM – Avid Bookshop: Avid has gained a reputation as one of the top independent bookstores in America, and regularly hosts readings from top authors from David Sedaris to Chelsea Clinton. 6:00 PM – Treats at Condor Chocolates: Life is short … eat dessert first! Peter Dale & his brother, Nick, opened this bean-to-bar Chocolate Cafe in homage to their mother, who is from Ecuador. 6:30 PM – Dinner at 5 & 10: Two-time James Beard award winner Hugh Acheson’s flagship restaurant is in Athens’ Five Points neighborhood. The historic home is a wonderful setting for refined fare with a casual vibe. 8:30 PM – Georgia Theatre Rooftop: Enjoy some of the best views of Athens from atop the world-renowned live music venue. Bar bites, local craft beer and artisan cocktails are a great way to spend a summer evening. 9:00 AM – State Botanical Garden of Georgia: The official botanical garden of the state of Georgia has 313-acres of themed gardens, including 5 miles of nature trails and a new Children’s Garden, which opened in March 2019. 10:00 AM – R. Wood Studio: Beautiful, handmade dinnerware inspired by the southern seasons is known nationally and made right in Athens, Georgia at Rebecca Woods’ studio. During a visit to the R. Wood Studio you’ll see artists at work and shop in the studio shoppe for one-of-a-kind pieces, or seconds of your favorite everyday pieces! 11:00 AM – Lyndon House Arts Center & Ware-Lyndon House: The Lyndon House Arts Center is a community visual arts complex that incorporates gallery spaces in a modern facility planned to be compatible with the architecture of the magnificent Ware-Lyndon House (c. 1856), a two-story, late Greek Revival home with Italianate influence. Meticulously restored and serving as a house museum of decorative arts, the house is listed on the National Register of Historic Places. Savannah, Georgia is a charming Southern escape where art, period architecture, trendy boutiques, and ghost stories are all set under a veil of Spanish moss. Savannah is a place where cuisine comes straight from the coast and cocktails are served at every meal. Come and discover the enchanting soul of Savannah.